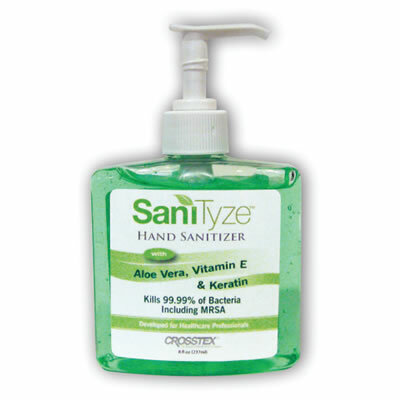 Crosstex's SaniTyze Waterless Moisturizing Antimicrobial Gel contains Aloe Vera, Vitamin E, Liposomes, and Keratin to moisturize skin. SaniTyze is latex compatible (no lanolin or petroleum-based emollients). SaniTyze contains 62% Ethyl Alcohol, meeting CDC recommended guidelines. It is available in 2 oz/4 oz bottles or 8 oz/12 oz pump bottles.